Think of it as a frequent driver's card. You might never have a hand-crafted exotic sport car parked in your driveway, but that doesn't mean you can't give one a spin in Forza. The popular Xbox driving simulator has more cars than some auto shows, and filling your virtual garage is half the fun. Now, the new Forza Rewards program will help build your automotive harem by handing out monthly rewards to players based on various tiers. The system works more like a traditional loyalty card than a normal unlock system. As you play Forza, you'll earn Forza Rewards points. Earning a certain number of points increases your tier level, granting access to more stuff. Once a month, gamers can cash out for in-game rewards like cars, tokens, and in-game currency. 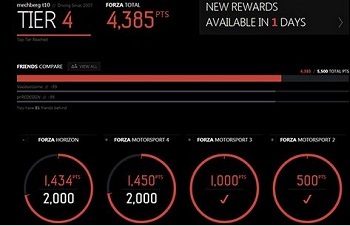 Currently, the rewards are only for Forza Motorsports 4 and Forza Horizon, but points can be earned in any Forza title going back to Motorsports 2. The system is currently live, and drivers can check on their rewards on the Forza Rewards site. You can also compare your profile with friends, which is good news for those in envy-based relationships. The system will also carry over to Forza Motorsports 5 when it launches on the Xbox One later this year.